First a note about the designation TRF – those letters have two different meanings depending on what era of radio design you are referring to. In the 1920’s and 30’s it stood for Tuned Radio Frequency. 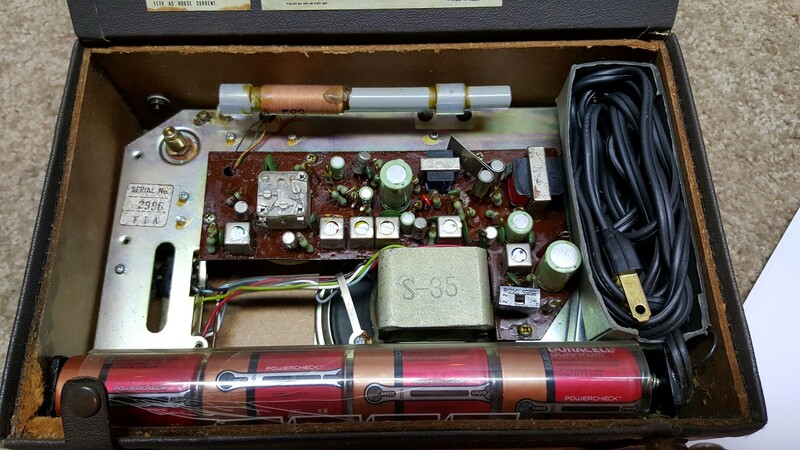 It means that each station you tuned in, for example 880 KHz remained at that frequency through each stage of amplification, each of which had to be tuned independently. TRF radios had three or sometimes four separate stages of RF amplification and each stage worked on that 880 KHz frequency. When you tuned to a station you had to bring three or four knobs into adjustment for that frequency. Usually these knob scales were calibrated from 0 – 100 and when you found a station you would note the numbers on each dial so you could return to it quickly. 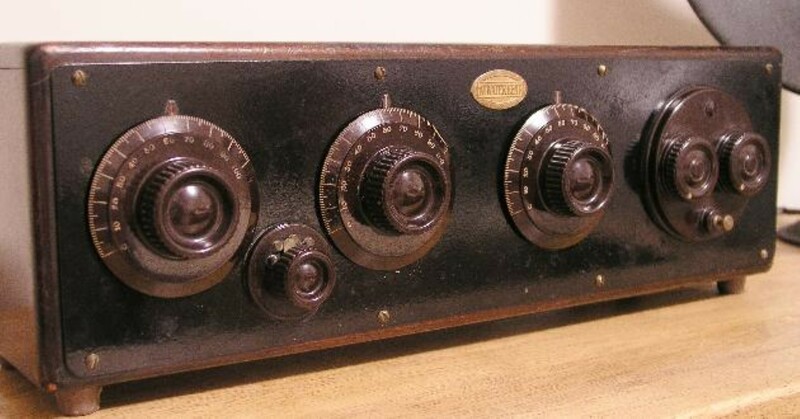 The typical TRF radio of the era was designed as a long low cabinet with three or four prominent tuning knobs on the front as typified by radios like these Atwater Kent sets. 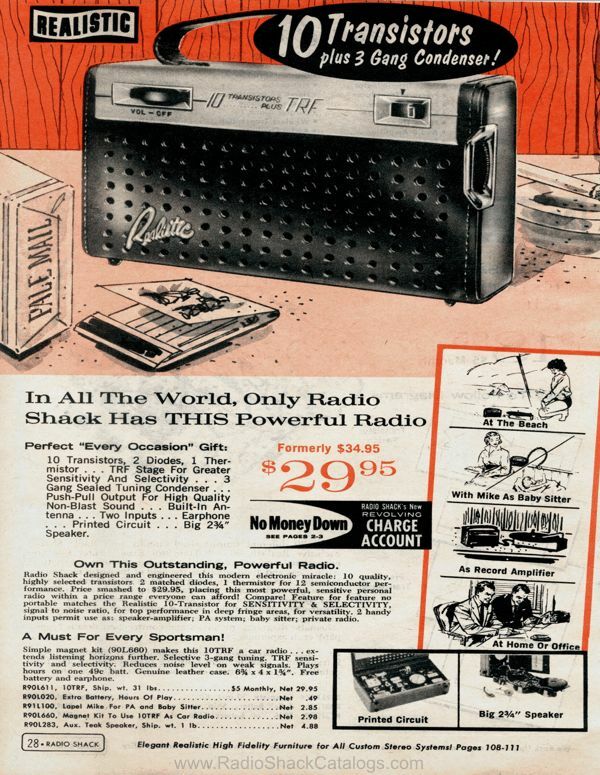 Later radios adopted the Superheterodyne design which converts all incoming signals to a single intermediate frequency or IF, (most commonly 455KHz for AM sets but other frequencies are used in some radios), which not only allows for more efficient design but also easier tuning with a single tuning knob. The best radios added an extra Tuned RF Stage at the antenna input which pre-selected and amplified the desired signal before it was mixed into the IF stage…this extra stage increased gain and reduced interference from frequencies other than the desired one. 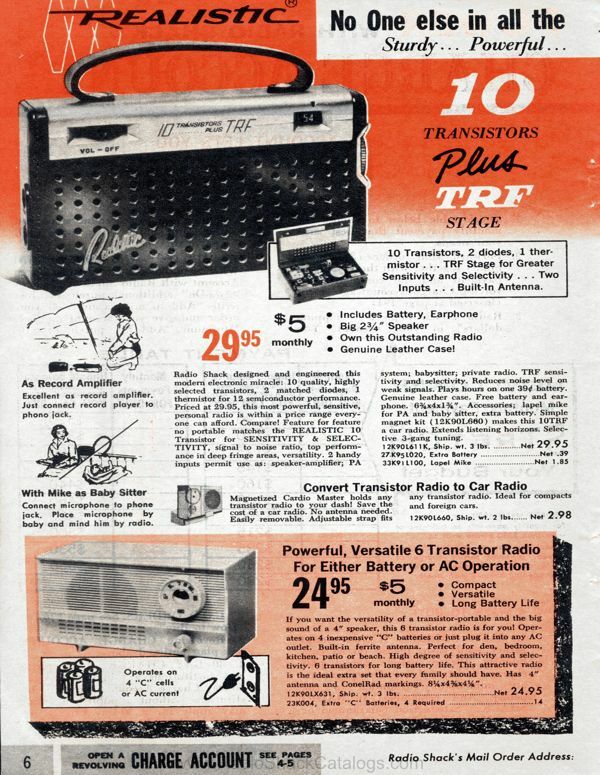 This Tuned RF Stage was abbreviated to TRF by Radio Shack who used it to advertise their top of the line radios as great performers. However many old-time radio people feel this is a misnomer, and whether or not you agree you at least now know why. But it is a fact that radios with tuned RF stages are usually better than those that don’t have one. 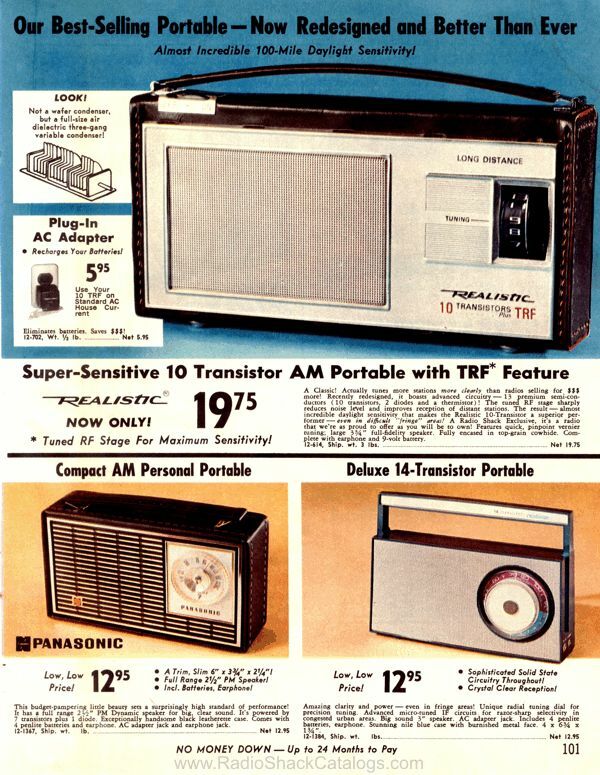 All of the better analog-tuned radios near the top of my AM Mega Shootout List are of this design. But there are exceptions to every rule. 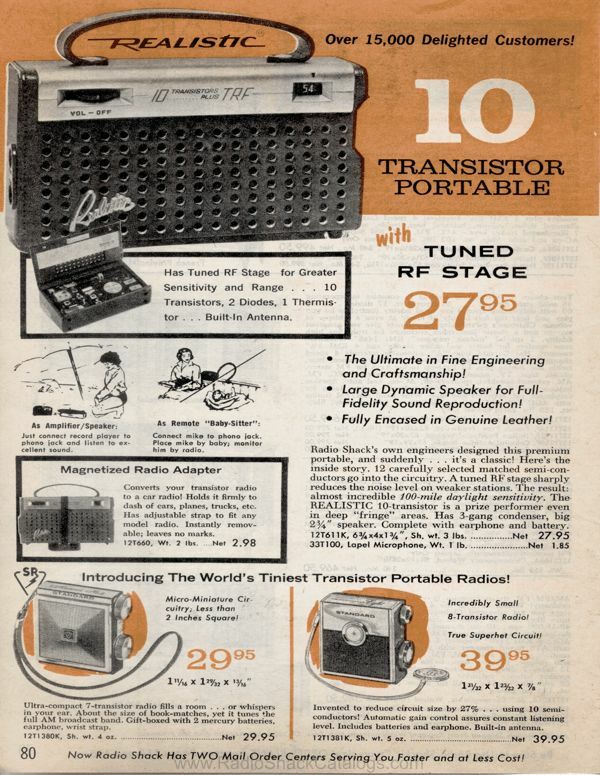 Back in the day I bought and returned two of the 1965/1966 Realistic TRF radios because they were inferior to several other 6 transistor radios (with no tuned RF stages) I compared them with. 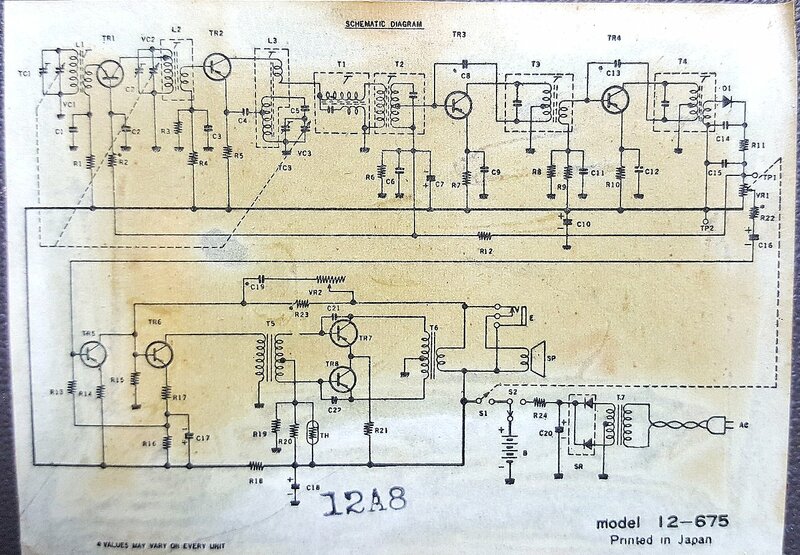 Evidently that RF stage didn’t guarantee that it was a properly designed radio overall or that other circuits in the radio didn’t ruin its performance. Maybe this shouldn’t have surprised me when a Zenith Royal 500H retailed for $59.95 while the 1965 Realistic TRF cost only $19.95. 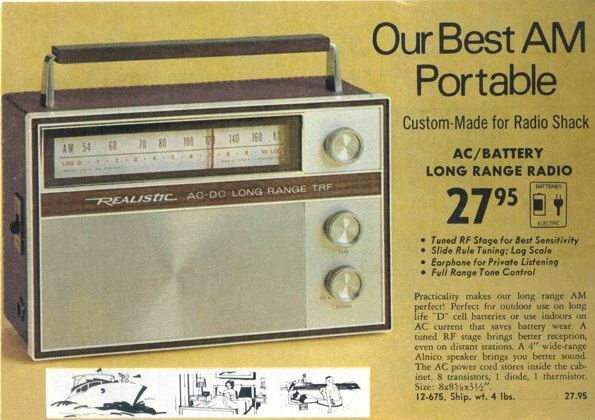 Luckily the model was vastly improved by 1968 (and still was only $27.95) with a model finally worthy of the name and that radio was produced essentially unchanged through 1972. 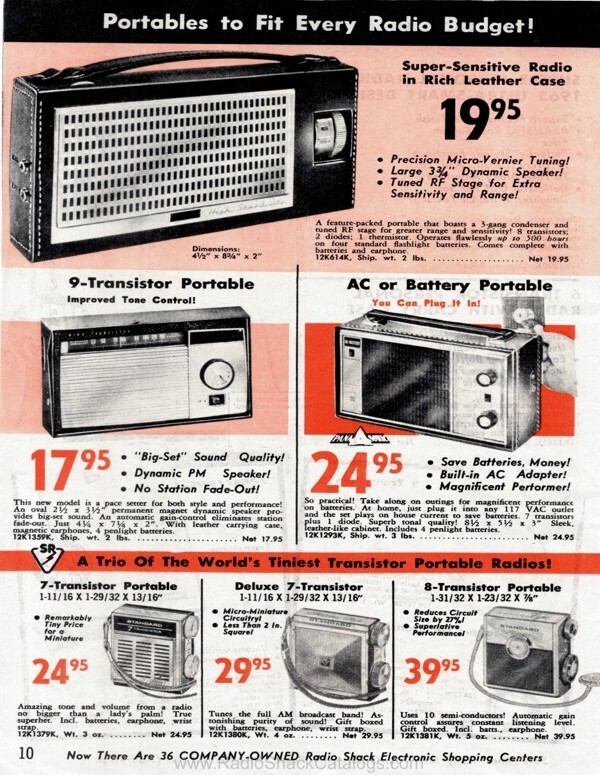 By the way you can see all of the vintage Radio Shack catalogs at this website…it is phenomenal! I eventually came into possession of two of these radios – one which I recapped and the other which was already done for me. 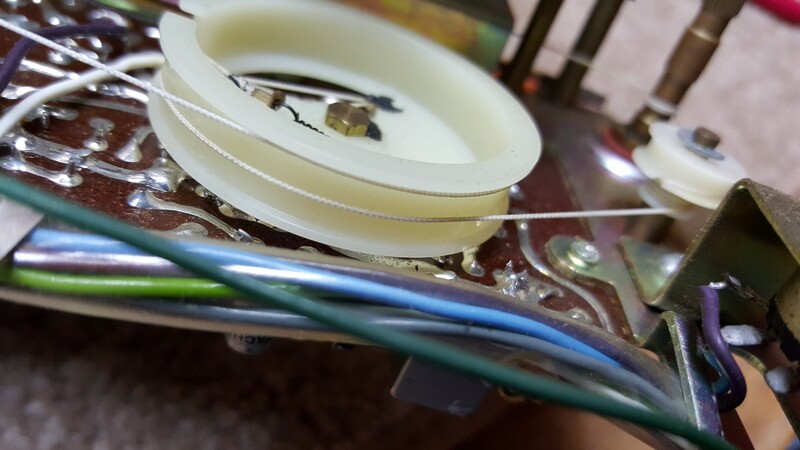 I had one of those gotcha moments as I was installing the last cap in the first set as my soldering iron touched the dial string which instantly sprang apart…not a good feeling. The dial string on these is not only no longer being made (and unusually thin compared with the dial cord I had on hand) but it utilizes a unique two-step pulley design which made figuring out how to install it trickier that it would otherwise have been for what looked like a very simple dial cord arrangement. 1 String Can Move At 2 Different Speeds! 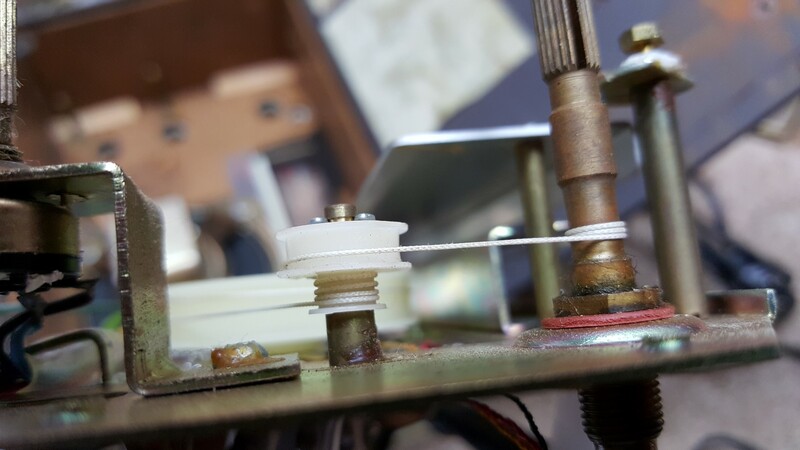 To explain, the two-step pulleys are a clever way to allow the dial pointer to move a large distance across a long dial scale while using a small pulley on the tuning condenser and a single dial cord rather than two in a gear-reduction design. 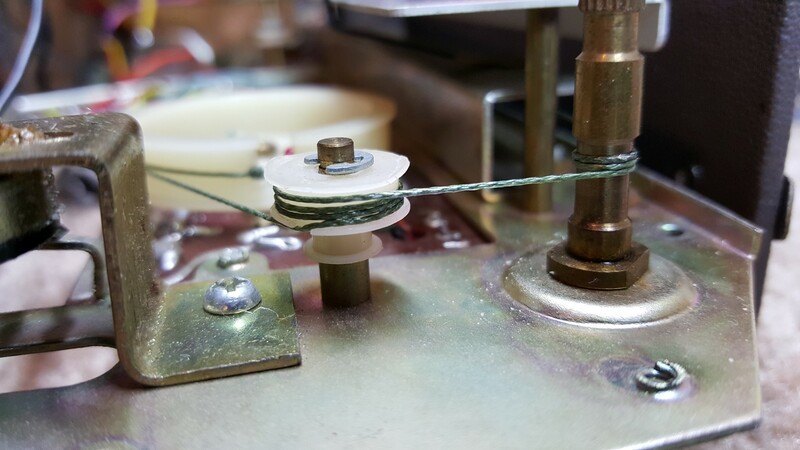 That single dial cord actually moves at two different rates of speed between the different size pulley steps. While this design is clever indeed, it makes it mandatory that any replacement dial cord be no thicker than the original because the pulleys won’t accommodate it. 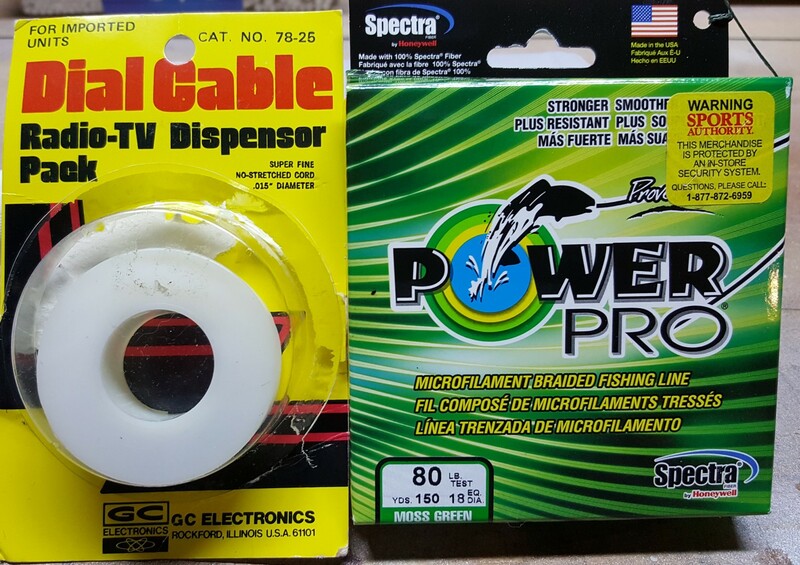 A friend eventually supplied me with some of the correct dial cord but not until after I had tried 4 kinds of fishing line and found one that actually worked perfectly…it is pictured here. It is actually a hair larger than the original string as you can see by comparing their diameters so if you can find a slightly smaller size it will match the original more closely, but this string worked perfectly for me…see picture. I will also say that lacking a service manual I would never have figured out how the two step pulleys are supposed to be strung without a second set as a reference. I never was able to find a service manual anywhere…if anyone knows of one I’d be thrilled to get a copy. 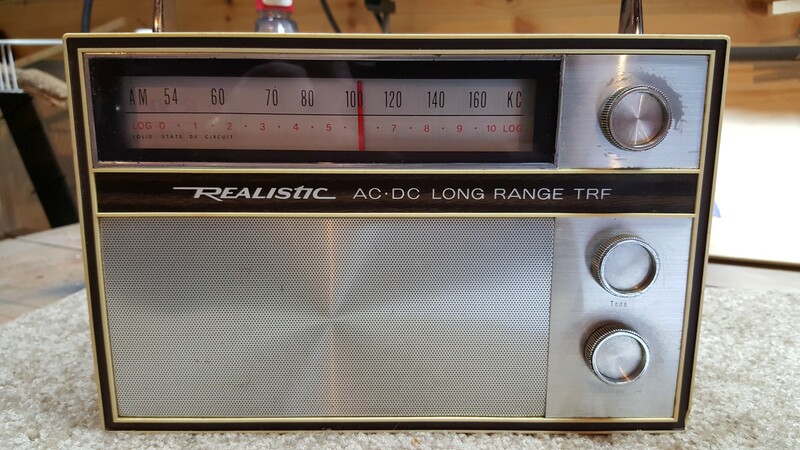 Performance: Although I had previously found the earlier models to be disappointing I was ready to be bowled over by this radio even before I received it. I tend to love old analog AM portables with huge analog dials and this radio really fits that bill. 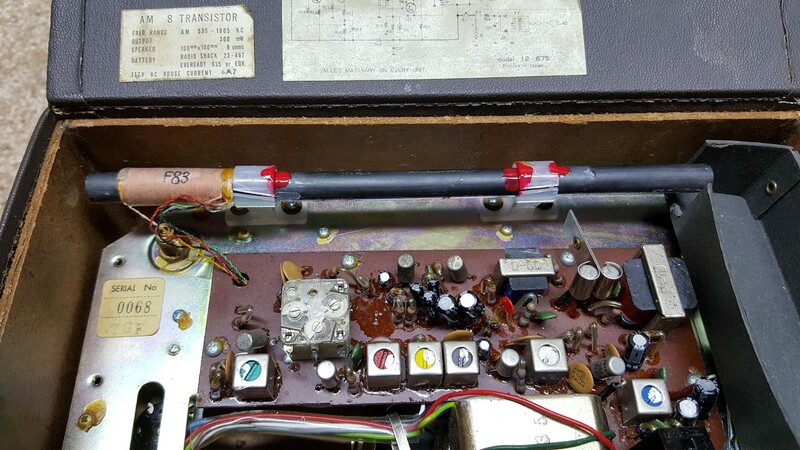 After these radios were recapped and aligned I was able to test them with the stock 6 ferrite rod antenna and again after replacing them with 8” ferrite rods. I found the performance to be good but not stellar. In the AM Mega Shootout listing the 12-675 rates as *** with it stock ferrite rod and **** with the 8” rod. This does indicate very good performance but not in the category of the ***** star radios. I also have to say that the sound is not of the highest caliber either. The stock speaker is distinctly midrange heavy and not very detailed or clean sounding…kind of mushy. I must say I don’t get much enjoyment listening to this radio. Is it possible other samples of this radio perform better? I suppose so. But the two I have are so identical it’s easy to assume they are typical and any hotter units are the exception, but until/unless I ever see a better sample for both RF performance and sound quality (at which time I would update this article) I rate the 12-675 at *** with it stock antenna and **** with a transplanted 8’ rod. And if anyone has a unit they think is better than this and would care to loan it to me for comparison I would certainly welcome that opportunity.